Father-son competitors Scott and Nick and Annis pose for a photo while participating in the Epic Race, a challenge from Vail Resorts to ski or snowboard â and post pictures â at all 26 of the mountains covered on the company's Epic Pass season pass. VAIL — In the end, it all came down to the details. Those are the words of Scott Annis of Loveland, who is now a lifetime ski pass holder at Vail. 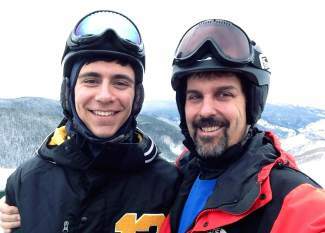 On Friday, Annis and his son, Nick, learned they were the winners of Vail Resorts’ Epic Race, a challenge to ski or snowboard — and post photos to the Web — at all 26 resorts on the company’s Epic Pass. Those resorts span America and Europe, across five states and four countries. The challenge began on Nov. 22 and ended Dec. 20; the top 10 finishers of the 132 in France that morning were awarded lifetime Epic Passes. Scott and Nick Annis’ race began modestly, with Nick finishing up his fall semester at college and Scott strategizing from his office. On the first day of the challenge, they visited Eldora resort in the afternoon after Nick attended school and Scott worked that morning. “We were in the middle of the pack for most of it,” said Scott Annis. When Nick finished finals on Dec. 10, they got serious. On Dec. 11, the Annises completed their U.S. leg at Afton Alps in Minnesota, and flew non-stop to Frankfurt, Germany. From there, they flew to Zurich, Switzerland, drove into Austria and managed to conquer both Lech and Zurs on Dec. 12. Most competitors knew all along the race would come down to the final opening day of the 26 mountains, Dec. 20 in Brides-les-Bains, France. On that day, Epic Racers describe a frantic scene. Racers scrambled to solve the clues and find the stickers described in the email. At this point, Josephine Hover had been waiting at the resort’s base station for five hours. “With the rush of adrenaline, we went straight for the clues and then we came to realize, sadly, that us being first in line at the gondola was not going to help at all,” Hover said. Meanwhile, down in town, the Annises had just finished having coffee. In the days preceding Dec. 20, the Annises spent their time exploring the town. The Annis’ had also read the email closely and knew to include specific stickers in their photos at the clues’ locations, a twist other competitors had overlooked. Scott Annis said Nick Annis insisted they carry all Scott Annis’ ski gear — spare shoes included — which may have won them the race. Crediting his son with their victory, Scott Annis said the two of them, especially 19-year-old Nick Annis, will get a lifetime of value out of their lifetime passes.